A systematic approach for improving performance while obtaining superior results with stronger, more attractive impulse heat seals. 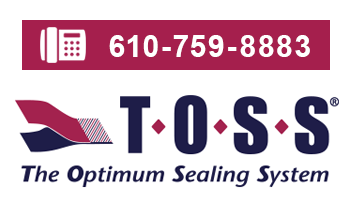 At TOSS Machine Components, Inc., we believe every enterprise should have a clear sense and understanding of its purpose and its obligation to provide service. In order to succeed, a business enterprise must meet a need and provide service that is of value. Further, the management must be able to clearly convey that message to its people and its clientele. It is to this end the 9 Steps is dedicated. The packaging industry uses plastic films, sheets, and composite structures to protect, preserve, and display a multitude of products for consumers and industrial users. These packages must be produced, shaped, and sealed into pouches and containers with unerring precision and integrity, often at high speeds. As the commercial world expands, distribution networks are stretched to reach into distant markets and packaging must be made to withstand the rigors of transport and handling. Medical and healthcare products must remain sterile, electronics and instruments undamaged, and fresh foods crisp and delectable. Plastic film producers continue to create unimaginable packaging materials with superior properties for the protection and display of products. These products must be sealed with integrity in order for them to be useful. The 9 Steps to Heatsealing Perfection are offered as an aid to those persons that are charged with the challenge of producing good packaging and Perfect Seals… Every Time. 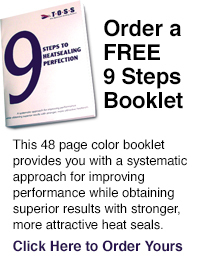 Click here to order a FREE 9 Steps booklet.